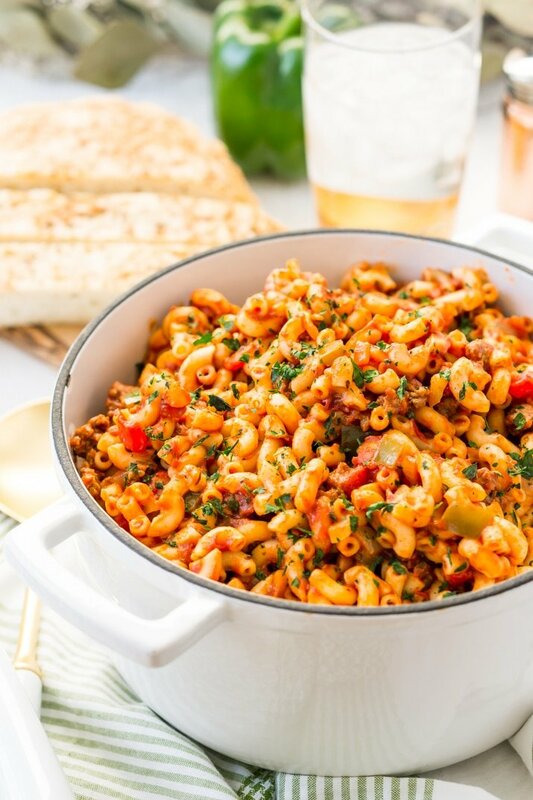 American Chop Suey is a delicious and easy dinner recipe made with ground beef, tomato, onion, green pepper, macaroni, and spices. Pure comfort food made on the stovetop in just 30 minutes and makes a great weeknight dinner! I’m not sure if it’s a New England thing because I could probably eat my weight in American Chop Suey. Maybe it’s the fact that its pure comfort food, or maybe it’s the perfect balance of flavor, but either way, I freaking love Chop Suey! So I wanted to share my recipe with all of you in the hopes that you’ll love it too! 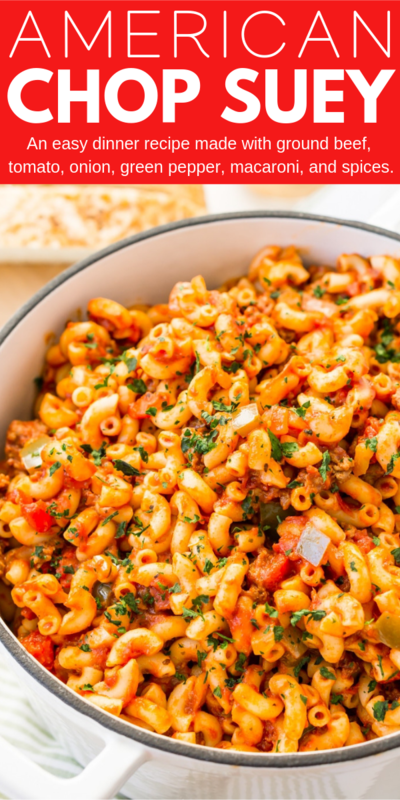 We call it American Chop or Chop Suey here in New England, but you may have also heard of it called goulash or macaroni hamburger and tomato depending on where you live. So either way, the recipe has the same basic components and is a classic dinner most of us grew up eating. Why I Love American Chop Suey! I love chop suey because when it’s cold, I want comfort food and I think this is a super cozy dish and it’s really easy to make too! The dish is also similar to American goulash but the most noteworthy difference between the two is that Chop Suey doesn’t include paprika, or, at least not the way I make it. Some people also call it Chili Mac, but I don’t make mine spicy either. But there is one key ingredient that can’t be left out, the sugar. In my opinion, the best chop suey is one that has a slightly sweet tomato sauce, the sauce should be loose enough to coat, but thick enough to stick to the noodles. The sugar sweetens up all that tomato goodness and makes for a really delicious sauce. The green pepper and onions should always be sauteed ahead of adding any of the tomato-based ingredients! This recipe makes a huge batch of food, so it’s great for big families and it also reheats well in the microwave. Where it’s just the two of us in my house, I love making this recipe on Sunday afternoons, especially in the fall and winter, and then I reheat it for lunch all week long. 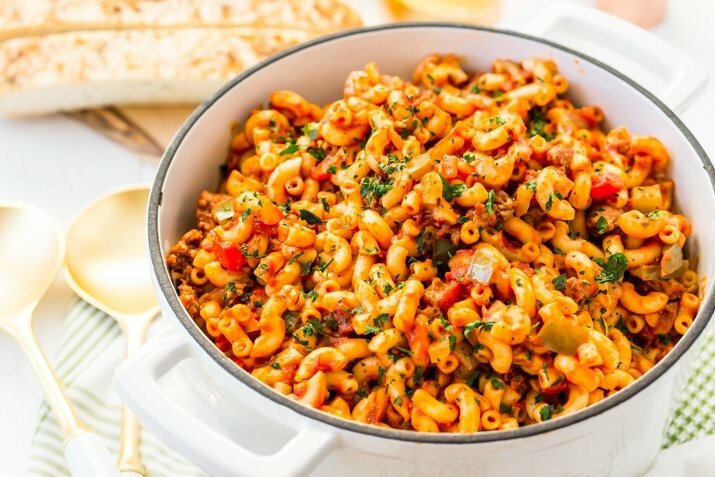 American Chop is traditionally made with ground beef, macaroni pasta, green bell pepper, white onion, garlic, tomato sauce, tomato juice, tomato paste, diced tomatoes, dried oregano, dried basil, salt, and pepper. Ground Turkey – If you’re looking to lighten things up? You can try swapping ground beef for ground turkey. Cheese – If you’re used to cheese in your chop suey, you can simply stir in some mozzarella and Parmesan cheese, about 2 cups or so should do just fine. Peppers – Green bell peppers are a staple in this classic recipe, therefore I wouldn’t remove them completely, but feel free to try out red, orange, or yellow instead. Mushrooms – So you’re a mushroom lover, are ya? Well, you can easily add them in. You can use either a small can or 1 cup of fresh chopped mushrooms, just add and saute them with the green peppers because you’ll want them to be nice and soft. Fill a large pot with water, salt the water and bring to a boil. Cook the pasta according to package directions. *You can either finish cooking the pasta and leave it in a colander and use the same pot for the sauce or you can start making the rest of the recipe in a separate pot while the pasta is cooking. In a separate pot or the one from the pasta (see note above), add the butter and onion to the pot and saute, stirring frequently, until the onions are translucent, about 4 minutes. Add the garlic to the onions and cook for 1 minute, stirring frequently. Add ground beef and cook until browned, you can cook this in a separate pan if you'd like less fat and add it to the onions after cooking. Add green pepper and cook until soft, about 5 minutes. Add the diced tomatoes, sauce, juice, paste, sugar, spices, and Worcestershire Sauce. Cook until evenly heated. Stir in the cooked pasta and stir to coat. Serve immediately or package up and keep in the fridge for up to 5 days. It must be a New England thing because I remember eating this all of the time too! Time to bring it back, Sandi! We called this goulash. It was great warming family main meal as I was growing up. So glad you enjoyed it, John. I’ve never heard of called that before, it definitely goes by a lot of names depending on where your from and your family heritage. I grew up on this as well, it was the first dish I learned to make in Home Ec. in elementary school, back in the late 70s. I now live in Australia and my husband asked me what was the first thing I learned to cook, so here I am about to whip up a pot for him. Aussies love bolagnese, (not the authentic kind), that they have adapted to their taste, more or less a meat ragu. So let’s see how American Chop Suey from New England fairs In OZ! I hope he loves it, Dawn! My family would be very happy if I served this up for them. Thanks for mentioning that the sugar is a vital component – I have a tendency to omit it from savoury recipes if i think I can get away with it, but now I know it’s an integral part of your recipe I won’t do that. We wish we were eating this right now! This looks so delicious! I could see why this would be a great dish during the cold weather, comfort food is what always warms the soul! great recipe and the images are impressive! Looks like some very comforting home cooking! Wow this looks spicy and tasty, perfect dinner idea! I grew up on this! Other than Tuna Casserole made with egg noodles, it is the only time we ate pasta. My mom did not use the tomato products. Instead she used Campbell’s Tomato Soup. And she never used the Italian herbs. Once in a while she would add a can of French cut green beans drained. Yes, there are a lot of different ways to make it! I grew up with “goulash”..but when I was in Maine they called it Chop Suey..the difference where I was in the east, they put molasses in it..what a wonderful flavor, and so different..
I’m from Maine and I don’t think I’ve ever had it with molasses in it, so interesting! I’ll have to try adding a bit sometime to see how it is! This is gulash. Chop suey is a dish developed in America for Chinese imigrants during the rail road expansion. Read a book. Love your response to Bill!! I was standing in Publix a few hours ago contemplating dinner. 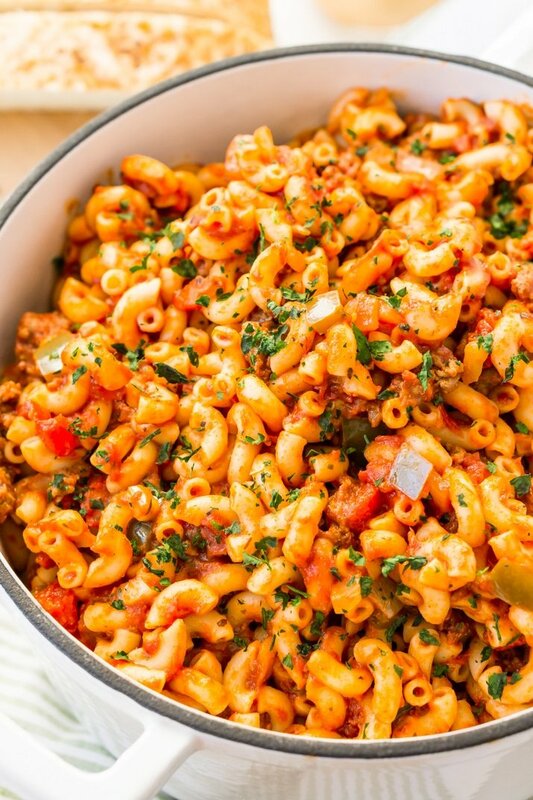 I looked over at the macaroni and all of a sudden remembered American Chop Suey- a meal I ate as a child in Massachusetts (I’m in Florida now). I googled the recipe and found yours! Looking forward to eating it and introducing my Florida kiddos to this New England classic!! Thank you Lissi, I hope you enjoy this recipe and it takes you back! Seriously, fella, your knowledge of the culinary world seems to very limited. But I congratulate you for an excellent job of displaying your ignorance in that comment. Just cooked this last night and it turned out great! I used gluten free pasta and it worked just as well. I also used tomato puree instead of peeled tomatoes and ground turkey instead of beef. I think this will become a staple in our household! Thank you! 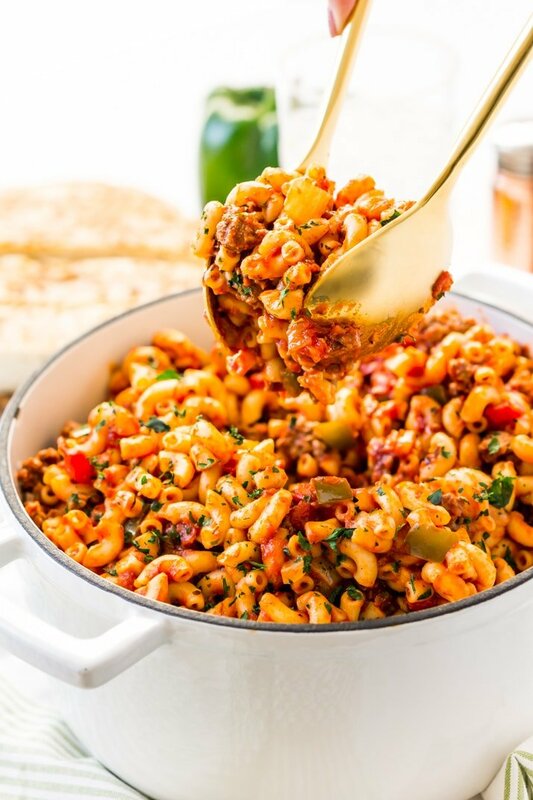 I grew up in Connecticut and my Mom would make American Chop Suey like this when I was young, but she would use egg noodles. Still love it. I think the key is the green pepper though. Absolute must. She made goulash also, but that was with chunks of beef and a more beef tasting gravy as opposed to tomato. That was put over egg noodles or mashed potatoes. Hi Nancy, so glad you found the recipe! It sounds like your Goulash was more like the Hungarian version, that’s the kind of Goulash I grew up with too. I grew up in Mass. but have lived in New Hampshire for decades. 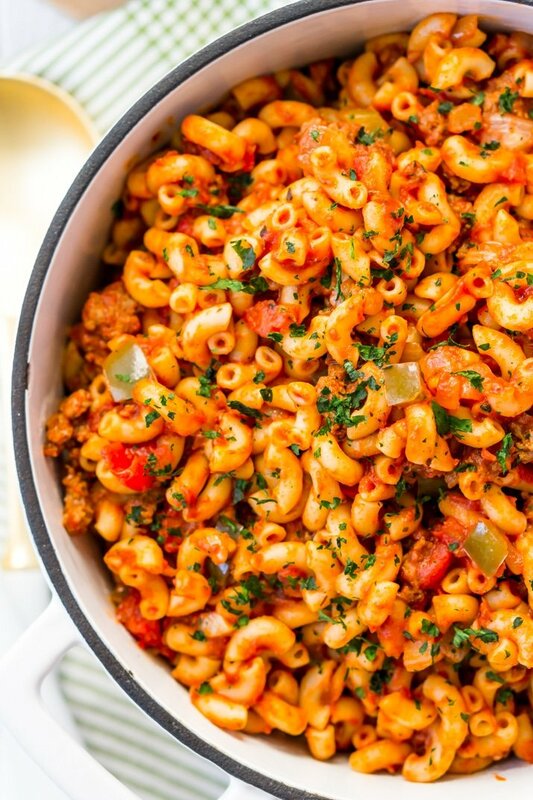 We grew up calling this Goulash, but over the years the name evolved into American Chop Suey. I rarely, if ever, hear it referred to as Goulash any more. The few times I have seen it offered on restaurant menus, it is called American Chop Suey. 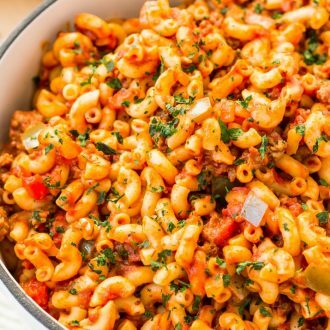 Basically, we made it with elbow macaroni, hamburg, onions and a tomato based sauce – no bell pepper, no spices other than salt and pepper. I now make it basically the same way with the addition of Italian spices, some fresh basil, oregano, mushrooms, bell pepper, maybe some grated parmesan and whatever else strikes my fancy at the time. But no matter how it’s made, it’s just plain good! Hi Holly, that should be fine, the sauce just might not be as thick but it will taste fine.